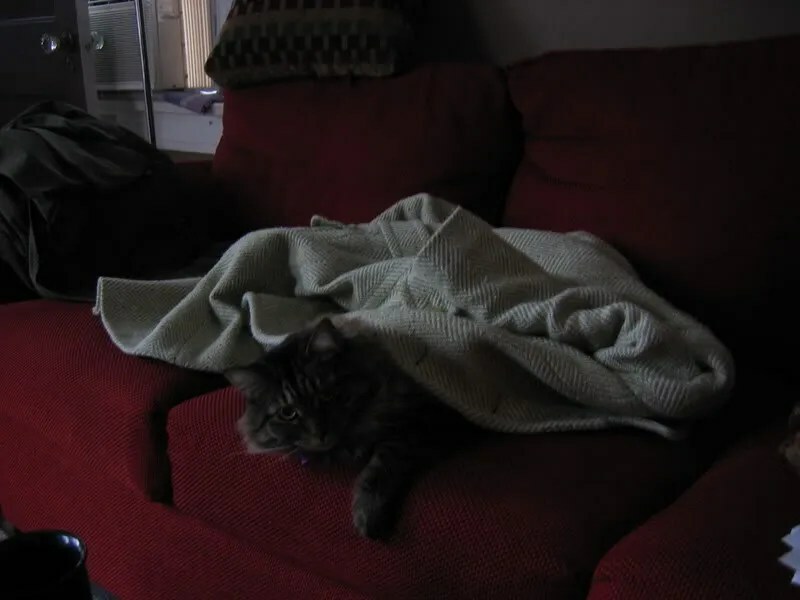 Yes, that’s me… the one hibernating in her house to avoid all the holiday cheer. It’s not that I hate Christmas, it’s just… ugh, stress. I only have one rehearsal remaining with my choir before Christmas, and I really am worried. I won’t go into the details, I will just say that it’s really hard being the replacement for a particularly beloved director. How to strike a balance between tradition and new things? How, in fact, to change anything without seeming like I’m being mean about everything that happened before I got the job? I keep telling myself “You can’t please everyone.” Which is true. And also totally not helpful, because I want to please everyone. And I am worried I may be getting sick, which just cannot happen right now. I need my voice. See, there I go… grinchy grinch grinch. I want to be more cheerful, but I just don’t think I can for another 11 days… so please try to understand if I’m a little behind in my replies etc… all will return to normal in January! Even my knitting has been stressing me out lately, resulting in me starting and immediately abandoning at least 5 projects. Fortunately, I finally seem to have found two projects that are sticking. Firstly, I have finally found a project for my Disco Lights! This is the Swing Scarf from Exquisite Little Knits. I have seen this project on Ravelry, and had mentally filed away the pattern. Yesterday I went to the library, where I found a copy of the book (and realized I had ignored it on previous trips because it has some sort of furry green capelet on the cover.) 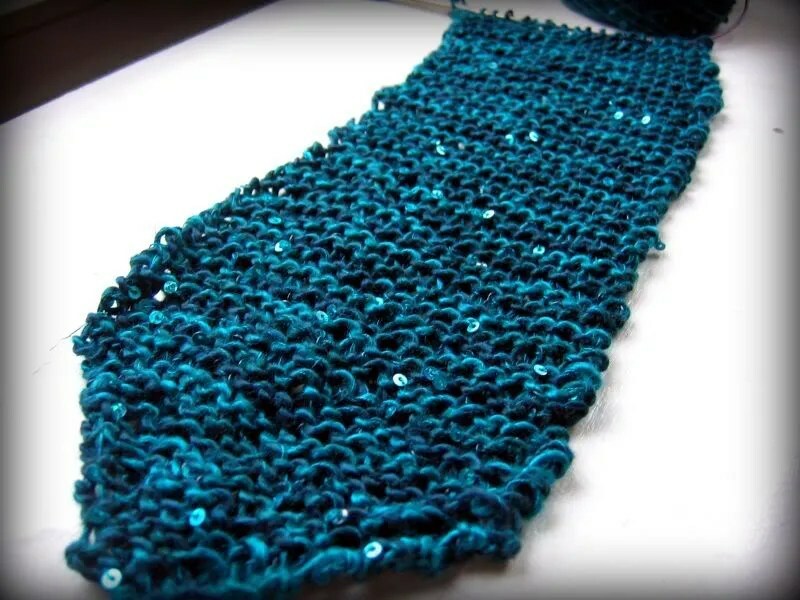 I got out my size 8 needles and cast on… what a wonderful pattern to show off the sequins! 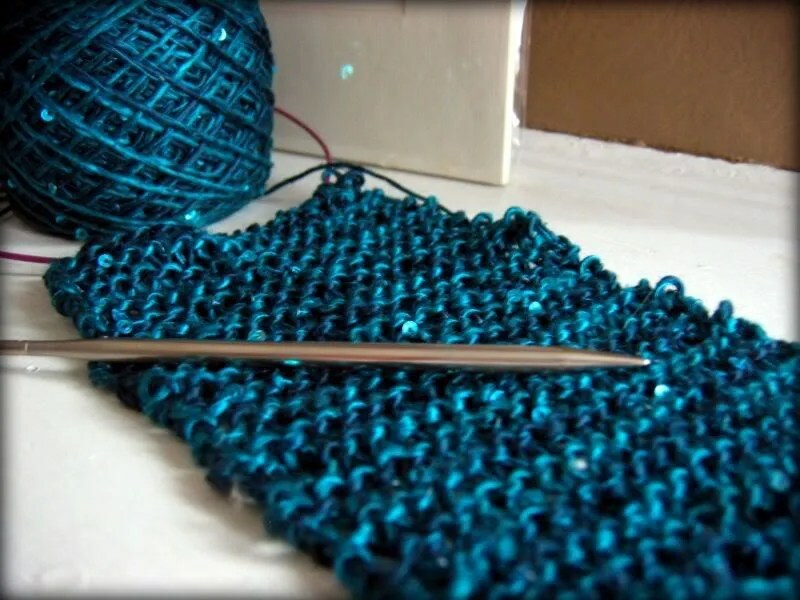 I love the soothing garter stitch, and the pointy ends are nice. The pattern calls for adding tassels, but I am on the fence about those… we will see when I get done. I’m aiming to wear this for New Years, a goal which should be easy since there are only 19 stitches per row. I hope you don’t mind some more photos… I just adore the way this yarn is knitting up, and the silk is so wonderful to knit with. I have also cast on and then ripped several patterns with my Figgy Pudding yarn. I was all set to make the Leyburn socks, but I have learned to fear patterns that say “stitch pattern is not stretchy” and then call for less stitches than I usually use for a sock. I didn’t feel like adjusting the numbers, so I will work that pattern at a time when my brain is more available. 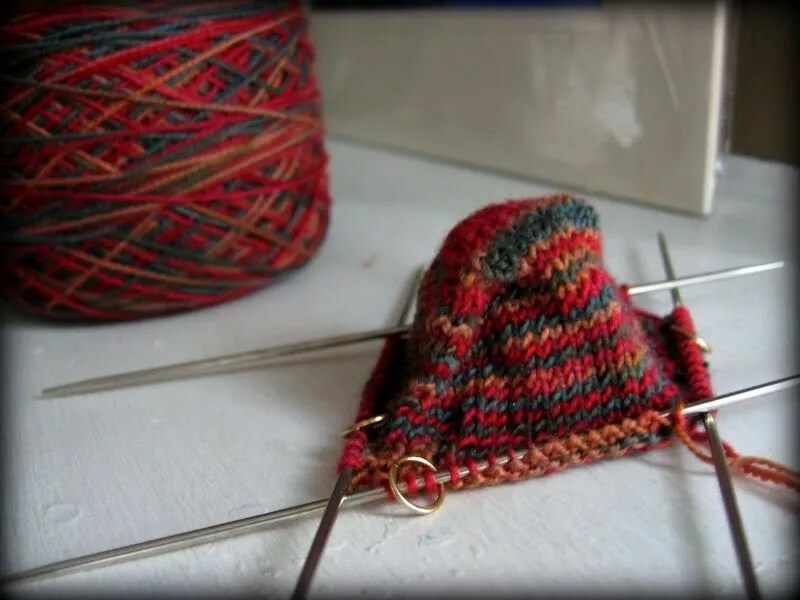 I want to make toe up socks, so I got out Sensational knitted socks and used the Easy Toe. 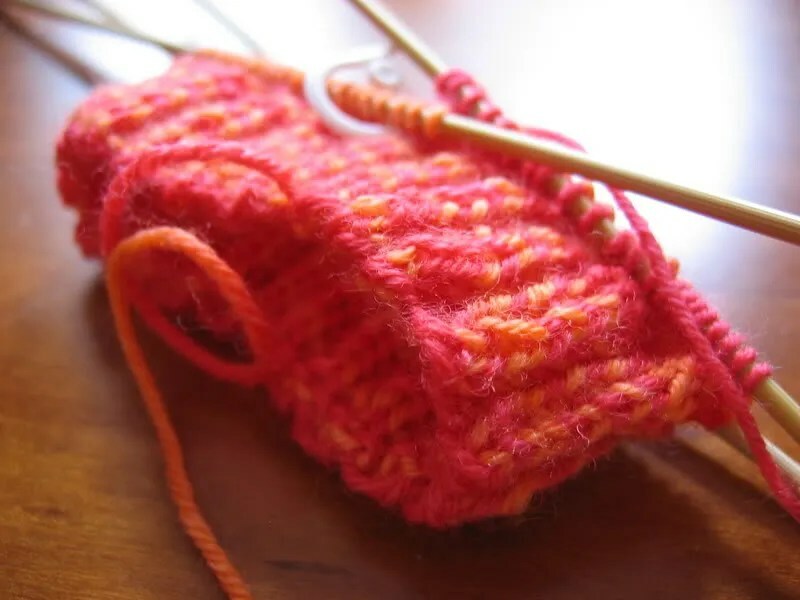 Well, that’s not true… first I tried the short row toe 3 times, hated the way it looked all three times, swore off toe up socks forever, and then discovered the joy of this toe. These are currently set to be the Firestarter socks, but that could change if the pattern is too hard for my brain right now. I need to brush up on my “Cabling without a needle” skills. I learned how once, but I get all confused about which direction to go. The gathered pullover still looks like a giant tube of stockinette, but I am now to the cables. My stress related knitting ADD has left it sitting lonely for a bit, but I may pull it out tonight and work on it. We are going to Cincinnati tonight to help Marc’s parents decorate for Christmas, and that means knitting time, both in the car and on my own after they go to bed. I got my pianist to cover the Saturday mass this weekend, in the hopes that this little break will re energize me for the push to the holiday! Christmas, I mean. Thank goodness! After all the stress of holiday parties/crazy work schedule it’s been really nice to just do nothing for the past week. I don’t have much to comment on about Christmas, except to say that it was very nice. I got three knitting related gifts, all things that I asked for. I recieved copies of Knitting Vintage Socks, Yarnplay, and Weekend Knitting. While I wasn’t that enthused about the sock book when I flipped through it in the store, now that I’ve actually read through the book I love it! I can’t wait to start a pair of socks based on one of the patterns. I haven’t actually recieved the other two yet because the Post office is slooow. Marc ordered them in early December and they shipped on the 11th. We still don’t have them. I, in the meantime, have recieved three different packages of yarn. Today we emailed Amazon to complain. I understand slow holiday shipping, but three weeks is really outrageous. I want my books! I can sum up Christmas in one photo. 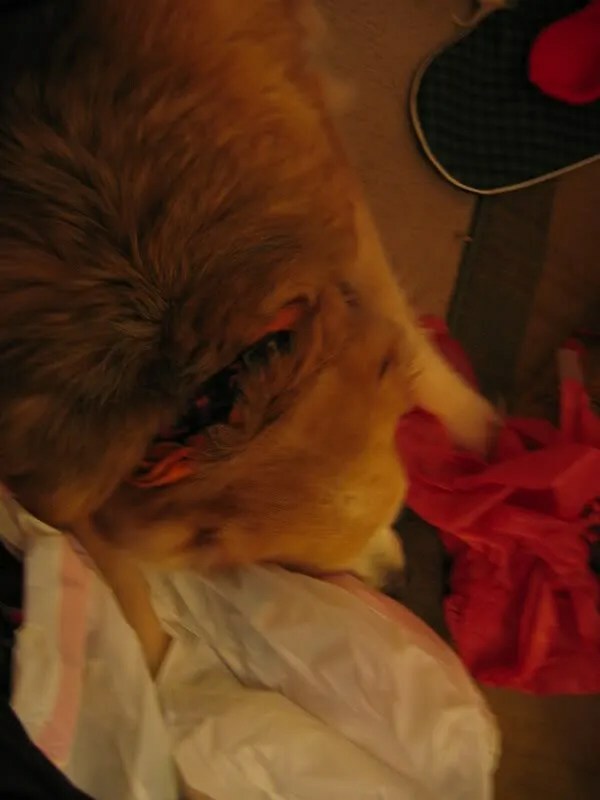 That’s my Mom’s dog after the unwrapping carnage, and I can certainly relate! Our house is looking better now, but since we’ve just finished moving all my things in it’s a wee bit messier than I would like. Marc has spent all week showing it off to his out of town friends, which makes me crazy since I’m so OCD about things being picked up. I think they understand though. We stayed in Cincinnati for three days following Christmas, so that Marc could visit with his sister and her husband. They live in Wisconsin and usually can only visit twice a year. Marc even wore their Christmas present from last year to please his sister. Yes, but he’s my… well, you get the idea. I visited two fiber stores in Cincinnati that I hadn’t before. First we went to Fiberge, which was nice and big, although I wasn’t too impressed with their selection. I did get to see the Louisa Harding book I’ve been coveting, and I decided not to buy it. Wonky sizing. A size 38 sweater for a 32″ bust? I think not! I hate it when sizing is too big for me, because while I am thin I don’t think it’s crazy to have measurements that will fit a 34. We also went to Knit on, which is in Bellevue. I had heard that the store was crazy messy and crowed, and indeed it was. They had a fabulous selection, if you could find what you wanted. I ended up buying a skein of Mountain Colors Bearfoot in Huckleberry. Isn’t it pretty? I love the pinks. The second rib and cable sock is nearly finished. I worked on it during the limited time I had in Cinci. When I got home I had a package of Debbie Bliss Merino DK waiting for me ($27 for a bag from little knits!) so I was finally able to cast on for my Jess sweater. This pattern is remarkable easy to follow, and I think it’s going to go really fast. 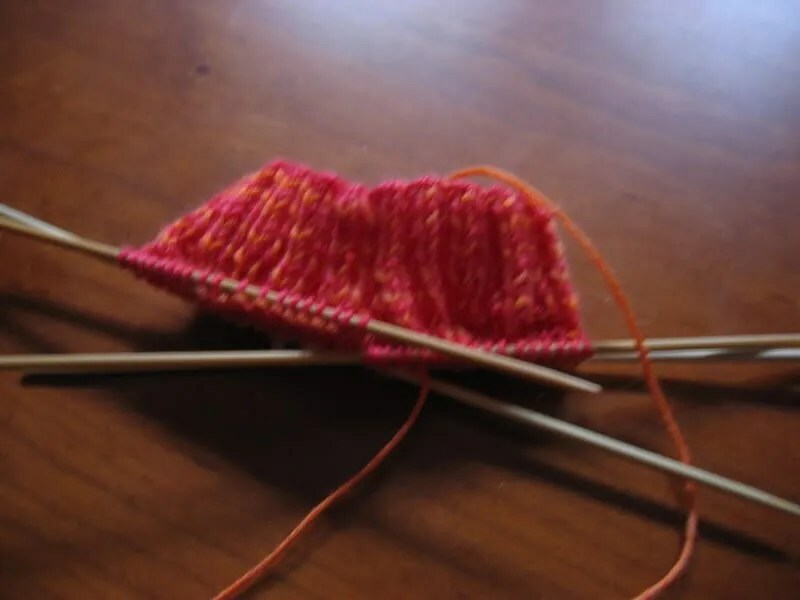 The above is maybe 2 and half hours of knitting – not bad! Here’s a closeup of the basketweave pattern. 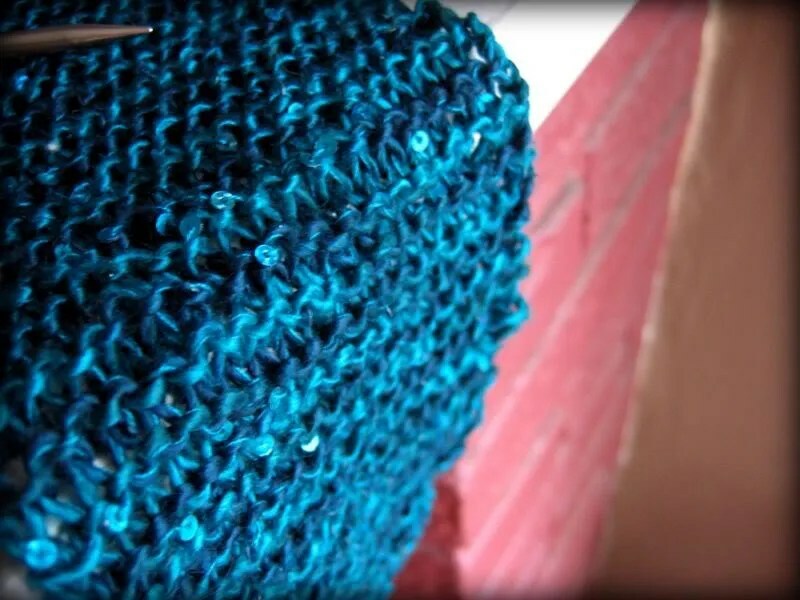 The yarn is really a gorgeous color of teal. I was expecting the DB merino to be at least a bit scratchy (I have heard that it was), but it’s as soft as can be. Elann is getting this on clearance in January, and you’d better believe I’ll be lined up for that sale! And some sock yarn from theknitter.com. I ordered this so long ago that I’d given up on it ever shipping – and now that it has the order is totally screwed up. *sigh* I’m not going to return it though. I hate to think how long that would take! I cannot recommend this store. L to R: Mountain Colors bearfoot in Sweet Pea, Cherry Tree Hill supersock in Green Mountain Madness, and more bearfoot in Flathead cherry. 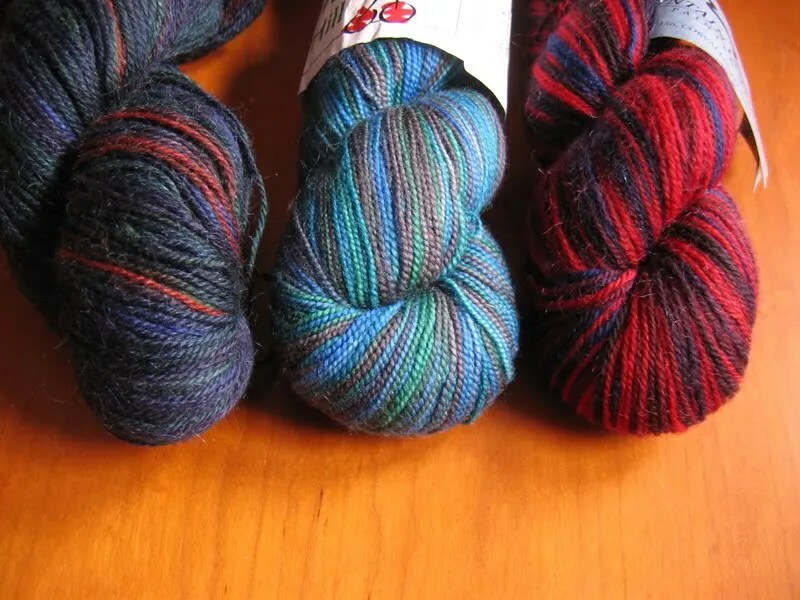 I did order (and love) the flathead cherry, but the CTH should have been the Superglitz (I’m ok with that though – I love the colors enough to knit socks with it) and the Sweetpea is just wrong. I ordered a totally different color. I don’t think I would use the sweetpea, because it’s too similar to other yarns I have, so I’ll have to sell it I suppose. 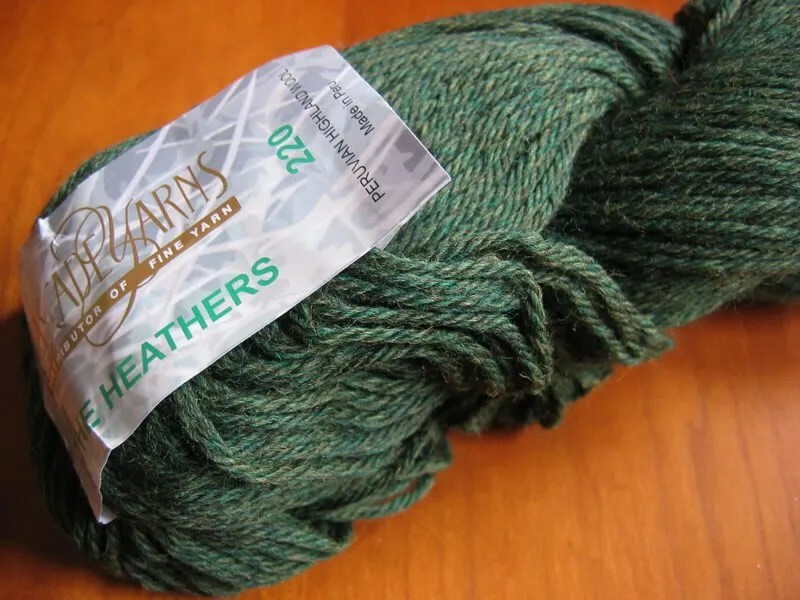 There are a ton of online and B&M yarn sales before the new year, and I feel like I should order, but the only order I’m contemplating is Knitpicks. 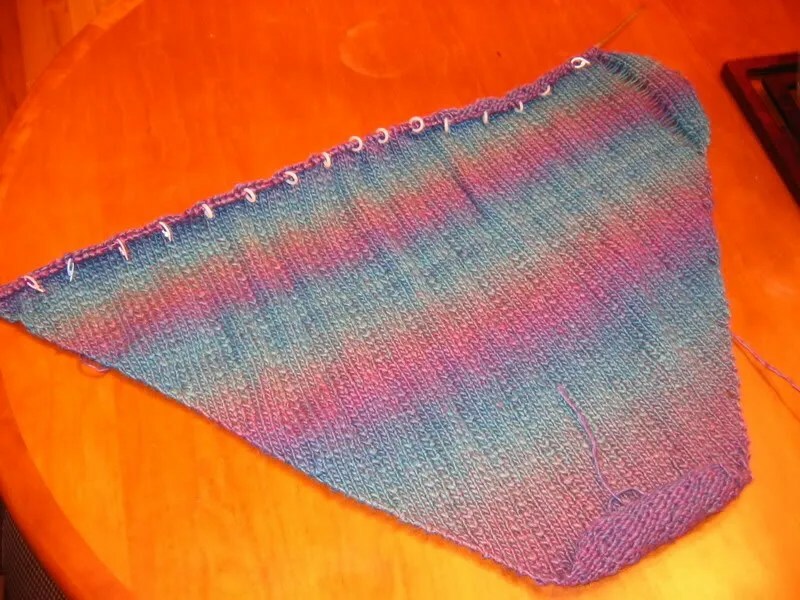 I want to make Knit and Tonic’s Sahara sweater out of Andean silk in the near future, and I need to order some more cables for my options needles. And (I can’t believe I’m saying this) I’m happy with my Sock yarn stash. 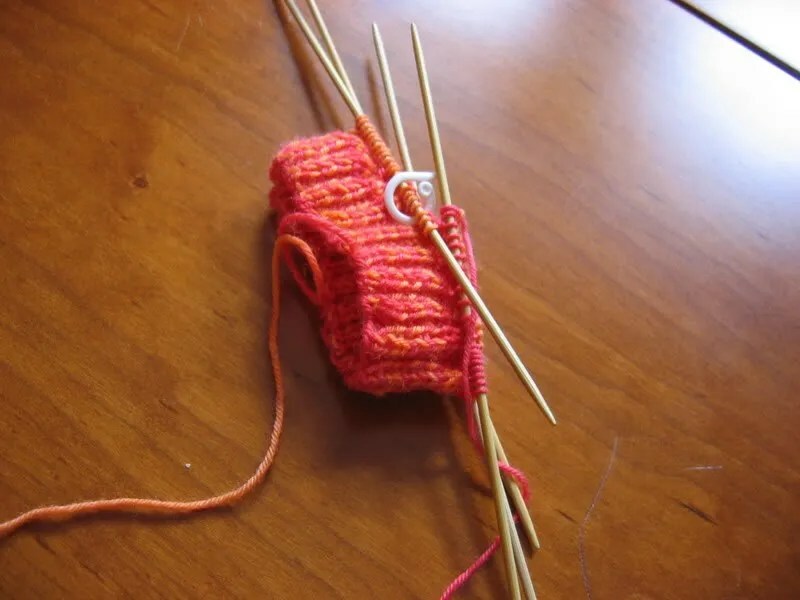 I want to try to knit a pair of socks a month during 2007. Sorry for the monster post, now that I’m back I should be able to be more regular. 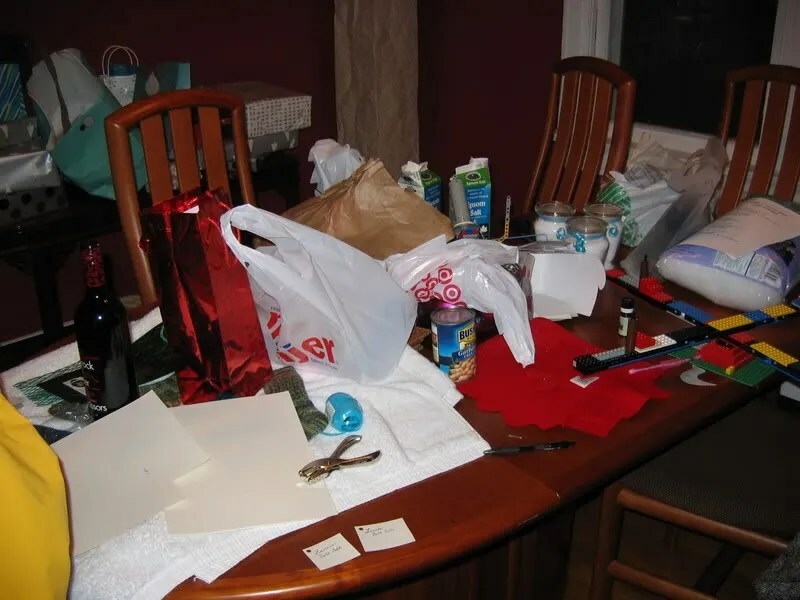 This is what it looks like when you’ve just finished the 4th out of five Christmas masses, and you’re desperately trying to assemble Christmas gifts while packing to go out of town at 2 am. No, I really don’t know why there is a can of Garbanzo Beans there. I think they just saw the mess and decided to join in. My crafting for the holidays is finished, minimal as it was. All that’s left is to assemble the packages, which I would imagine will happen at some point before I have to reappear in church at 9:30. We’ll have Christmas with my Mom after church, and then we’re off to Cincy for 3 days to visit Marc’s family. Plans include many family gatherings and hopefully a yarn store or two! I already got to open one of my Christmas presents… but it would seem that Dionne has claimed it. Isn’t she a cutie? It isn’t because of the camera… she looks terrified like that 95% of the time. I needed a lap blanket desperately, and I’ve finally acknowledged that I’m never going to get around to knitting one. Happy Holidays to you all – I’ll see you back here on Wednesday! Marc’s family have owned this plant since he was a little boy. His Mom was going to throw it away, when Marc suddenly decided it reminded him of his childhood and brought it home. I was not amused. I don’t have any houseplants because A. I won’t wanter them and B. Plants kind of freak me out… especially big giant plants that sit by the window and stare at me. Yes, I know that it’s crazy. I would say that the tree has grown on me, but that would be a lie. Marc accuses me of trying to murder the plant, but that isn’t true. 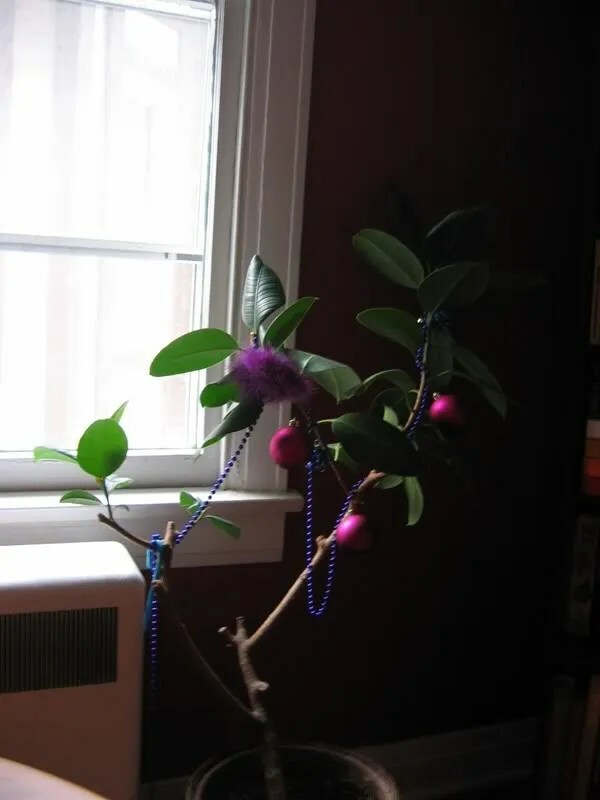 And we aren’t getting a Christmas tree because there’s really not room, so… happy Christmas, rubber tree plant! What’s that you say? They look exactly the same? That’s possibly because I got 4″ down the leg of the last one and had to rip. I was making the larger size, because I’d seen so many people claim they turned out tiny. After 4″ I had to admit that they were going to be huge on my teeny ankles. Plus I did the decrease wrong for the first inch. So I ripped and started over, and this time I am determined! The sock bug has bitten me hard. I just spent an hour staring at my computer, trying to tell myself that I really don’t need any Trekking XXL sock yarn. Or the “Angel” colorway of Sweet Georgia sock yarn. It’s a sickness I think. I only have a few balls of sock yarn, but I can already see how hard it’s going to be to avoid the temptation. After all, it’s just one skein, right? Not like I’m stashing yarn for an entire sweater. And yes, 25 dollars for a pair of socks would have seemed crazy before, but maybe I just didn’t appreciate socks. It’s a sickness I tell you! In other news, we bought a new dresser. It will be half yarn, half my clothes. It’s a Target special, so last night we spent a good three hours assembling the thing. 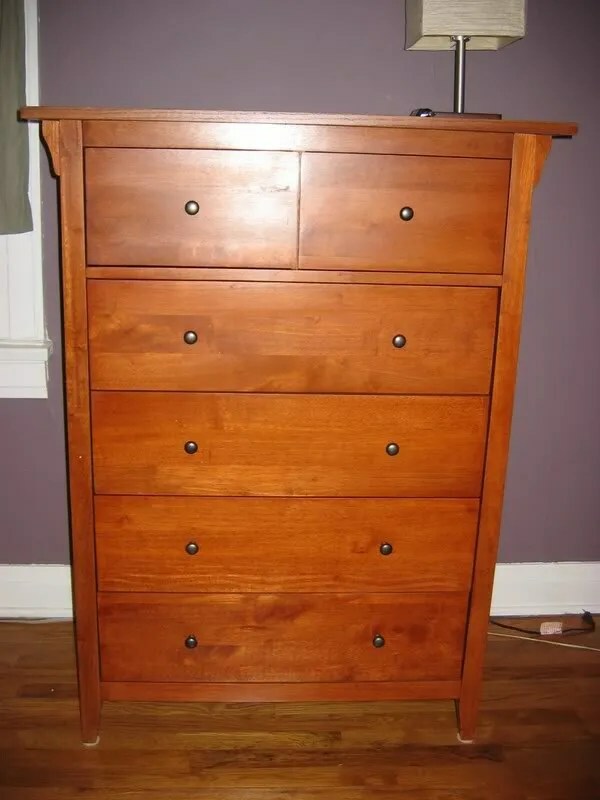 I think it was worth it though – I really love the dresser, which has mission style slats on the sides. I own the matching desk too. I apologize for my lack of response to the last several days’ comments. I’ve spent most of my time trying really hard not to get sick. It really makes my day to get commments, and I’ll respond soon! In fact, I’ve been making a point of commenting on the blogs that I read, because I love getting comments so much. I have a vague sore throat and general sense of unwellness. I took a 3 hour nap today, followed by another hour-long nap after dinner. I really don’t want to get sick just yet – I have two more weeks of teaching to get through. This afternoon Marc and I went to my Mom’s, where we helped her to decorate for Christmas. Her house is easy to recognize – it’s the one with the giant peace symbol. Why yes, I am the child of hippies, why do you ask? 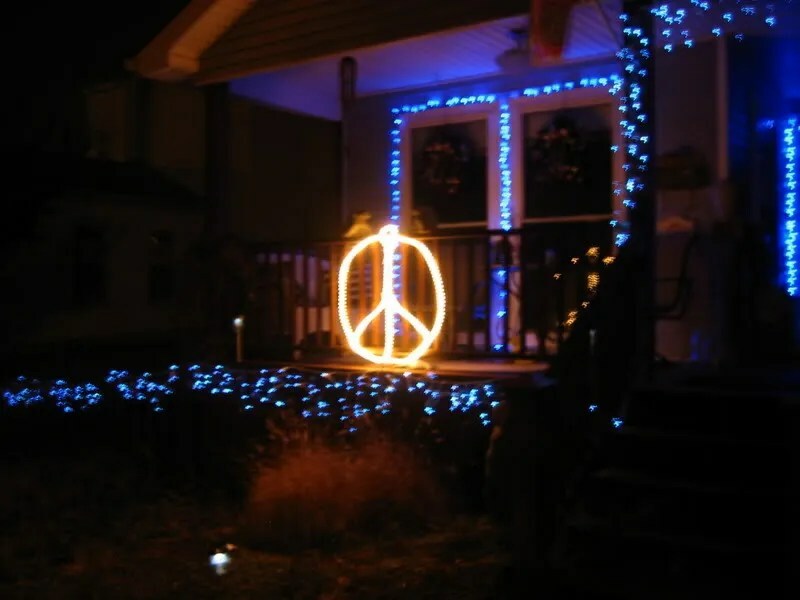 My Mom lives a few blocks from us, and I’ve seen a few other peace symbols crop up after she started this a few years ago. Did I mention that I love my neighborhood? Because I do. I haven’t knit since Friday. Yesterday I was resting my hands, and today I’ve been asleep most of the time. 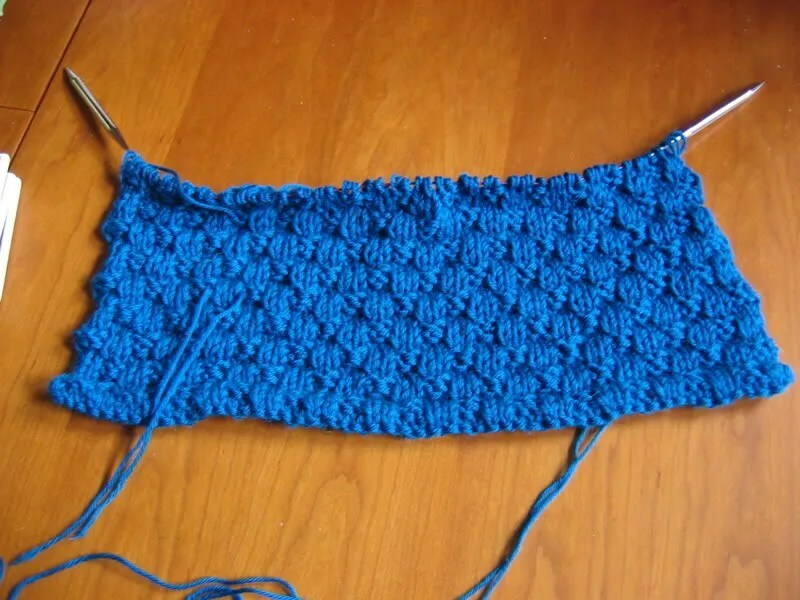 I’m two repeats into the straight section, and it hasn’t become tedious yet. The stitches are easier to drop than on my last Clapotis. They do have to be helped along, but it isn’t too stressful. My goal for finishing this is still Christmas eve, so that I can wear it to the many holiday obligations I’m bound to have. I only have one more washcloth to knit and all the holiday stuff will be done, so hopefull I won’t get too sick of this. It took me 3 weeks on the last Clapotis, and that one had more repeats than this one will. I think I’ll go knit now. Since I slept all day I’m not even faintly tired, so at least I can get something done! 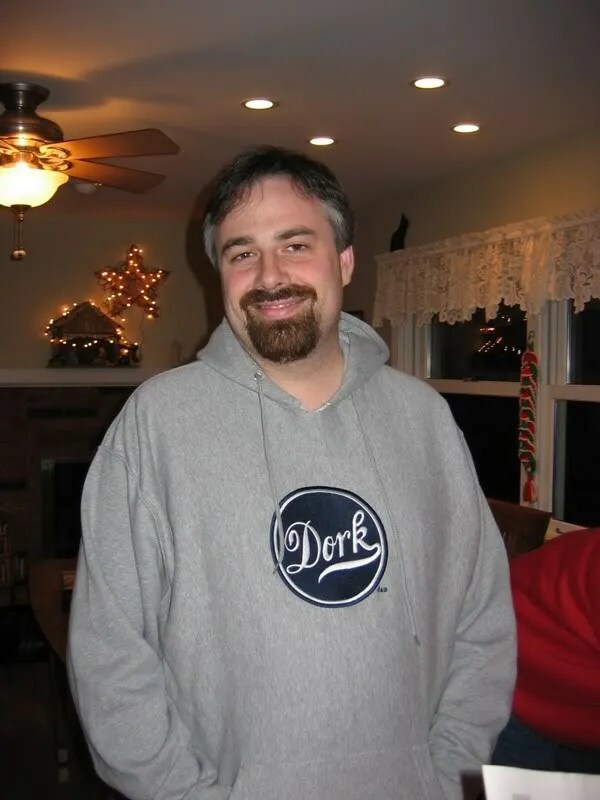 Marc came home unexpectedly today – I wasn’t expecting to see him until he gets back from Scrabble at 2 am or so. It turns out that all the electricity at UofL went out, which makes it exceptionally hard for him to accomplish anything on the computer. So he accompanied me to the Grinny Possum in Jeffersonville. It’s a good thing too, because I had once again managed to get my southern Indiana towns switched in my head, and I would no doubt have searched around New Albany for hours. There are 3 towns on the river that all sort of blend together for me. The store was ok, but I didn’t see anything I really needed. I did fall in love with Noro Silk Garden color #203 (pretty olives and blues)… I will continue to tell myself that an entire giant stole in Silk Garden would give my tendonitis fits. I got to see some Southwest Trading company yarns in person too. The variegateds are all too bright for Lady Eleanor I think, and besides I’m totally in love with the silk garden (my poor bank account!) We came back across the river and went to the Knit Nook, where I unfortunately did find some things. 5 Skeins of Lamb’s pride bulky. Isn’t the color fabulous? Yes, my green obsession continues. 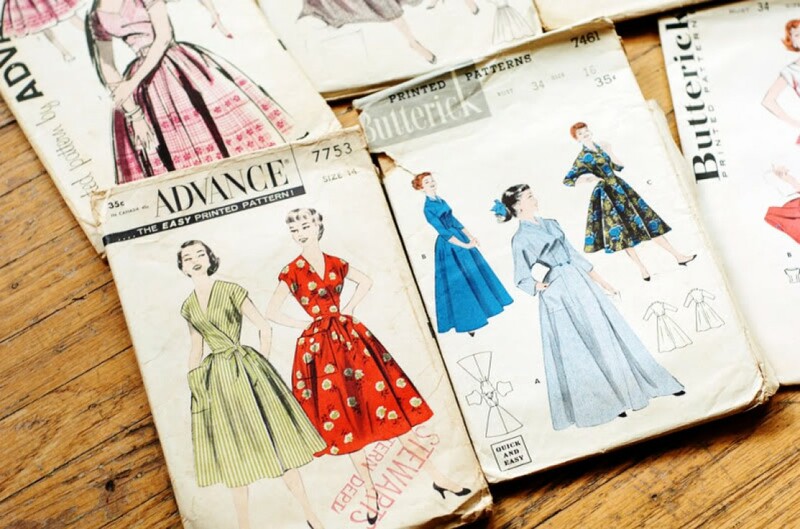 I want to make the Provicial Waistcoat from the new Interweave knits out of this. I was suprised when I saw this was made with bulky yarn, because it doesn’t look it. But hey – hopefully this will be a relatively quick project then! The model is wearing the smallest (30″) size, and she looks around my size. 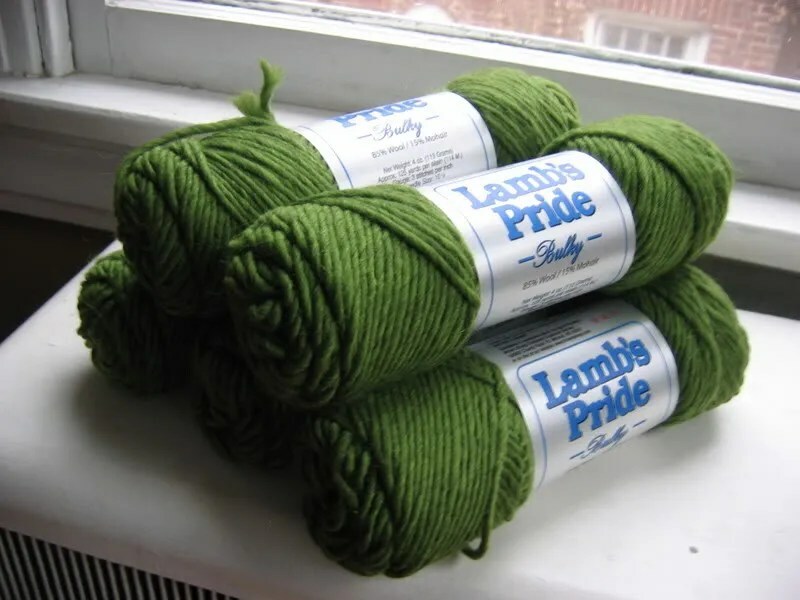 I’ve never used Lamb’s Pride before, but the color and softness won me over. As an aside I really liked the winter IK magazine. I want to make the Equestrian blazer too – I am such a sucker for blazers. WEBs has Classic Elite Skye Tweed on closeout for majorly cheap, so I’ll order that soon. Here’s hoping for yarn GCs for Christmas! I’ve asked Marc for a few knitting books. When we were first dating I used to be disappointed by his “practical” gift ideas, so I’ve now given in to the idea of a list. I’ll be happy if I get Yarnplay and Knitting Vintage socks! 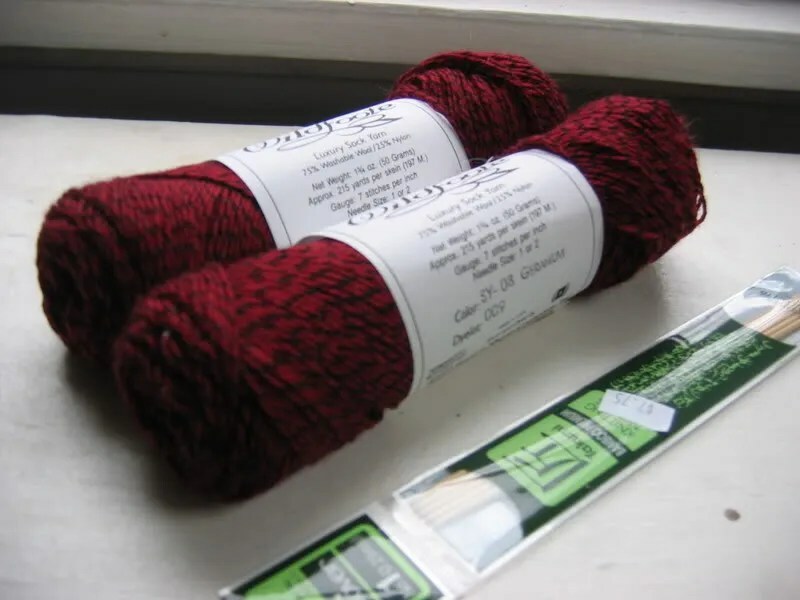 I also got some Brown Sheep co. Wildfoote sock yarn. I’ve been wanting a red and black yarn, and this was the best I’ve found locally. Some people don’t like the wildfoote but I do. 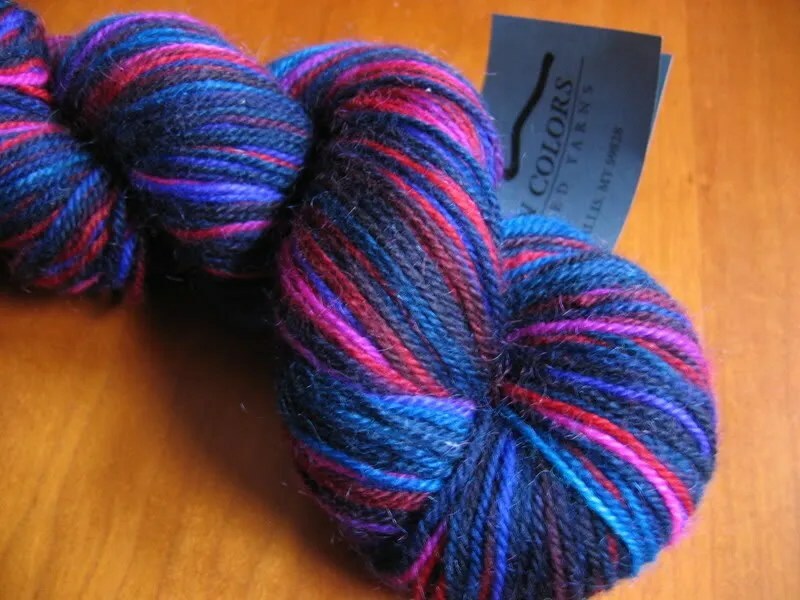 Plus it’s cheap – $5.50 a skein! The temperature is down 30 degrees from yesterday. It’s so cold that the cats are huddling for warmth underneath my coat. Poor kitty… all he wants is to be covered up at all times. 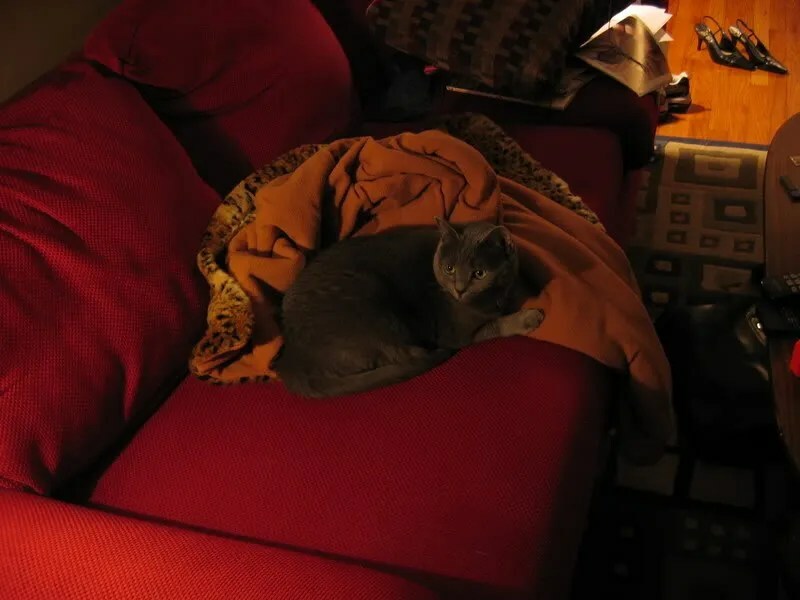 He’s the only cat I’ve ever seen who wants you to tuck him under the blankets with you. I’ve dropped my first stitch on the clapotis! No new pics yet, because I want to wait until it’s big enough to really show the pattern. I still love the yarn. Tonight my plans are to slave away at the Clapotis while watching star trek and the DVDs of the Bob Newhart show I rented from Netflix. The fact that this is my idea of a great friday night makes me feel old. It’s been unseasonably warm here for a week. Last night we walked to trivia wearing short sleeves. I like warm weather as much as the next person, but enough already! I’m getting tired of having to keep all the windows and doors open. Tomorrow they’re predicting snow, which I’m not so happy about either. How about a comfortable medium? Last night at work I had two cancellations, presumably because the weather is making everyone sick. In my free time then I gave the Jaywalker socks another try. The yarn is Lorna’s Laces sock yarn in Lucky Stripe. 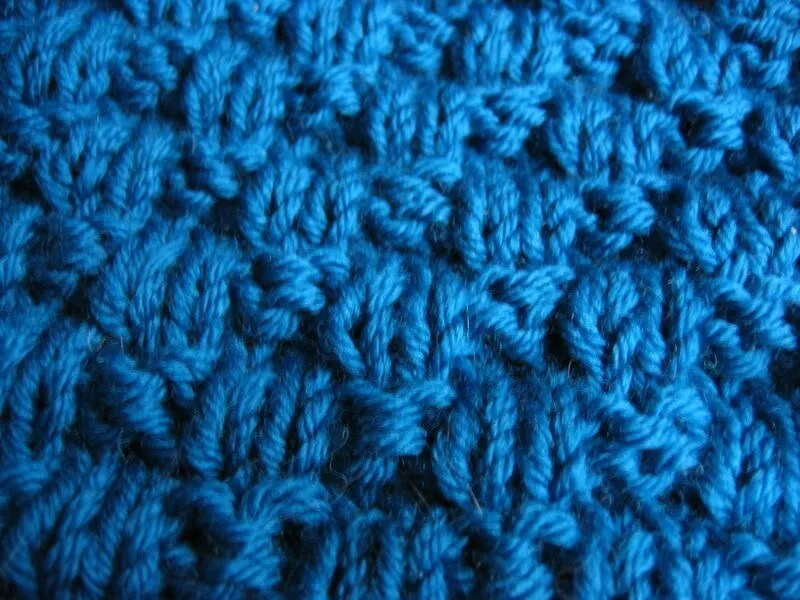 Here’s a gratuitous yarn close-up. They’re slightly more pink and less orange than they look here, but it’s pretty close. The pattern is going fine now that I got over my stubbornness and divided the stitches among 4 DPNs like the pattern calls for. I really prefer three, but after the laddering fiasco on Marc’s hat I think I’m going to learn to love using 4. Marc is going out of town tomorrow, and since that’s my day off I’ll be bored. My friends are all busy, so in consolation I’m going to try to finish some Christmas shopping. I still need to buy for my Mom and get a few baking items to make cookies. Does anyone have a good cookie recipe they’d like to share? I’m open to anything except nuts. I also realized that there are two LYS that I’ve never even been to, so tomorrow may be the day. One of my Mom’s friends recommends the Grinny Possum, which is in Jeffersonville, Indiana. Since we live downtown, Indiana is just a short little jaunt over the river. I also haven’t been to Sophie’s Fine Yarn shop. It’s in middletown, which is on the far east end of the city, and a good 25-30 minute drive. So I don’t know if I’ll make it there, but I was happy to see that the Grinny Possum carries Cherry tree hill and SWTC -yarns, neither of which are carried by “my” LYS. I love my LYS, but they have no sock yarn. Ok, they have wildfoote and Lorna’s laces, but not the Lorna’s colors I really want. They also have some of the self patterning yarn, but I’m not really into that. Of course, I may have to go there to fondle the Rowan Tapestry, since I’m not sure any other store in town carries rowan, and I’m still considering buying some. Hee… it always sounds so dirty when we talk about yarn shopping doesn’t it? I spent 5 hours yesterday trying on everything I own and then sending 5 garbage bags of clothes to consignment or goodwill. Now we have room for my clothes, and I no longer am holding onto things that I feel guilty for not wearing. I personally think this achievement deserves yarn, but then I think every achievement deserves yarn. Tonight we’re going out, since Marc will be in Lexington tomorrow. I’m trying to decide on a place. Nothing too crazy expensive, because I am cheap when it comes to food. I like good food, but I also like to cook, and I know how cheap pasta is. We were going to try Volare, but I decided it was too pricey. I would feel guilty. Instead I think we might go to Maido. We went there for Valentine’s last year and it was fabulous. It’s a sake bar, and sort of a Japanese Tapas bar if that makes any sense. You can get lots of little things, and they have great sushi too (just not a sushi bar to sit at). Japanese is by far my favorite food, and I’m glad so many new places have opened around here lately.